We’re back for the Normal-type reviews, and today we’re going to focus on Castform, the Pokémon that changes form under different weather! If you are ready with this one, please proceed. 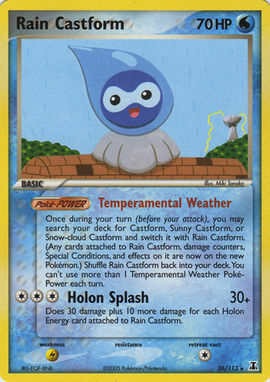 Castform’s abilities revolve around weather. On its own, it is unassuming. But then, when you add in weather, it transforms. Depending on the weather, its type will change. In Hoenn, where the weather can change and legendaries that control weather live there, Castform finds use after being artificially created. Abilities were introduced in Generation 3, so there might be a lot of ideas for how abilities could be implemented. One of these ideas is to have the ability to change form in battle. By putting together the idea of weather and abilities, Castform came to be. Castform is considered an artificial Pokémon, meaning that at one point it was man-made, but even then, it is not exactly evident that it is like this, since Castform looks organic and fit well with other Pokémon that aren’t considered man-made, such as Reuniclus and Swalot. It does feel at home with other amorphous Pokémon since its shape is non-standard, yet it is not inorganic. Since Castform is a somewhat organic Pokémon, it’s possible that it is genetically spliced to be able to do this, or selective breeding is involved for the result to achieve this ability. Remember, Castform has a gender! The reason Castform is created is to assist in the weather forecast, thanks to its sensitive molecular structure that reacts to weather and humidity. It reacts to the weather in order to protect its body, which is small and light, by setting up a layer between itself and outside. Since it has water-like molecules, this essentially means that its layer is made of water, making it a sort of water-bender. Appearance isn’t the only thing Castform changed, as its feelings react to the weather. There are cases where people’s feelings change with the weather, so it’s not unheard of. After all, if your appearance reacts to the weather, you might also have a mood change. Even though there are more than three types of weather, Castform only takes a different form from three weathers: Sun (Fire), Rain (Water) and Hail (Ice). The missing weather here is Sandstorm, which is odd, since Sandstorm is a major weather. One possible reason is that sandstorm is not true weather, since it’s basically a strong wind on sand. Another reason might be that Castform is more of a Special attacker, while Rock is more of a Physical attacking type. Still, it’s a missed opportunity because there are advantages in having a Sandy Form, such as getting a Special Defence boost and learning some more Special attacks like Power Gem and Earth Power. Since Castform learns a fair share of Ghost attacks, perhaps it should have a Ghost form. 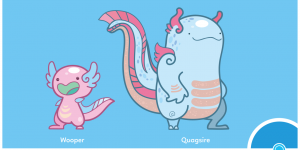 There are several Pokémon based on something Japanese, which is given since Pokémon’s designers are mostly Japanese. Castform is based on the teru teru bozu, a charm doll that is supposed to encourage good weather. It’s basically a head wrapped in a sheet tied to a string, so it looks like a little ghost. This must be why Castform looks like a little ghost who looks like it’s riding a cloud. A noticeable body part found on Castform is the two round protrusions in front. Those looks like a pair of breasts to some people, but I thought it looks like extensions of a cloud. A plausible explanation on why it looks like that they are shaped after the hydrogen atoms from the molecular structure of water, containing two hydrogen atoms and one oxygen atom. It should be noted that atoms are normally depicted as round, but those are just models of the real thing, since their shape is too small to verify. If Castform is just based on a charm that encourages good weather, shouldn’t Castform be encouraging them instead of changing form? Well, Castform must have been based on more than that. One might consider a weather balloon, a nifty device for gathering information about the air, aiding in forecasting the weather. In a sense, Castform is both a charm and a weather reader. 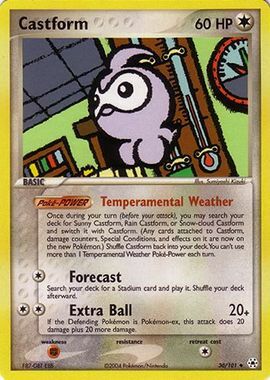 Even though Castform is a weather specialist, this advantage is difficult to make use of in battle. Part of the reason is its stats. While balanced, they are on the subpar range. Sure, it has a nice range of Special attacks, but its Special Attack stat is not high to make use of it, though the form change at least gives STAB on some of them, especially if Weather Ball is used. Changing form only when it enters battle is an advantage because it bypasses Stealth Rock’s penalty on Fire- and Ice-types. Still, serious battlers are not likely to use a Pokémon that relies on something that takes a lot of setup, since Castform’s stats are lacking and not specialised. Even when we have strong Pokémon every Generation, it’s nice to have some unique Pokémon every once in a while because the appeal of Pokémon is not necessarily just being the strongest, but having unique qualities that make them perform something different compared to the norm. Castform is certainly a one-of-a-kind Pokémon since no other Pokémon does what Castform do. It means that Castform is still an original Pokémon even after all these years. Since Castform comes in three other different forms, each form gets their own card! Because of how Castform can change form, it can likewise do the same in the TCG, and as a result, change its attack and type. All three artstyles of each Castform set of four are nice to look at in their own way, so each of the artstyles are represented. The one in Delta Species is a bit less to my liking compared to the rest. 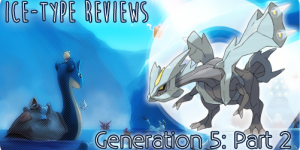 With weather playing a bigger role in Generation 3, a few moves and abilities were introduced to complement it. Weather Ball is one of the fruits of this idea. 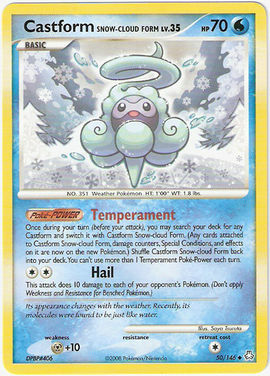 As this move’s name suggests, an energy ball that is affected by weather is generated by the user. Normally, this attack is Normal-type, but it will do Fire damage if there’s intense sunlight, Water damage for rain, Rock damage for sandstorm and Ice damage for Hail. If weather is present (even in fog), this move’s power is doubled, making it best used when weather is present. For a time, Castform was the only Pokémon with this attack, making it its signature move. 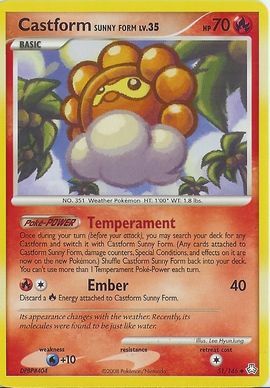 Since Castform could change its type in sun, rain and hail, it gets STAB on three weather conditions, leaving out Sandstorm (meaning it cannot have Rock STAB). Later on, other Pokémon started to get this unique attack, such as Roserade, Cherubi and Drifloon. A lot of the time, one could get the impression that Pokémon with this attack is associated with weather, judging by what this move does, even though some of them aren’t known for being associated with weather, such as Roserade and Bellsprout. This Special attack is very useful for Pokémon whose attacking style complements weather, such as Victreebel and certainly Castform. A lot of the time, this move is used for coverage because it turns into another useful type. Taking Victreebel as an example again, under the Sun, it will have a strong Fire attack that does about 150 BP of damage (after Weather Ball’s double damage and Sun’s Fire damage boost). Another example is Roserade. In Sandstorm, it will have a powerful Rock-type attack that hits Fire- and Flying-types best, ensuring that it could stand a chance against them. This move is quite good for its flexible coverage, but it only works best if weather is common because of the way this move works. If weather is not popular or you don’t have a weather team, then it’s not going to see use. Overall, the popularity of this move depends on the weather. ← Happy Four Years to Pikapi Podcast!